What would a gorilla do? This is the question I’d pose to my wife whenever we were struggling with our first baby. That is to say, all the time. Certainly not read books or blogs. And so, my point was this: Why is it that these majestic great apes could figure it out on their own? And why is it that us humans—some would argue majestic-er and greater apes—have to helplessly bumble through the jungle of parenting? One the most amazing things about kids is just how much they can love you despite your flaws and failures. And I don’t say this disparagingly. Parenting is hard—the hardest thing I’ve ever done. Books and advice articles are great (you’re smartly reading this, after all)—and I could probably do with reading more—but you can only learn so much from reading. With parenting, there’s a lot you just have to . . . figure out. Here’s some stuff I’ve figured out so far. Lunch was pickled beets. My daughter grabbed a great big handful of the deep violet roots and rubbed them all over her face. She grinned, beet gore making it look as if she’d just stalked, chased down, and feasted upon a wildebeest. My wife and I laughed—it was funny! And for the next three months, when the mood struck her (and the mood struck often), she’d smear her food all over her face. It wasn’t so funny anymore. Every reaction you make—laughing, smiling, gasping, reprimanding, yelling—reinforces behavior in some way. Your little one makes mental notes on how you react to everything he or she is doing and stores it away for later reference. But you can use this to your advantage. Now, there’s a lot of talk about positive and negative reinforcement, and both have their place, but there’s not nearly as much literature out there on neutral reinforcement: the art of doing nothing. No response. Just a blank, loving stare—no matter what is happening. It works great with toddlers and teenagers. Instead of letting your knee-jerk reactions steer the situation and reinforce (or discourage) a certain behavior, you can let the moment pass. And then after collecting yourself and your thoughts, respond appropriately. So, when your kid starts tossing food onto the ground for the dog to gobble up, a blank stare—rather than a stern No!—will give her the hint that this behavior is neither good nor bad and therefore not worth repeating. After all, if it doesn’t garner parental attention, why do it? IF you do __________, then you can . . . WHEN you do __________, then you can . . . Using the word if immediately makes the interaction a negotiation, a bargaining session. And once you start haggling with your kids, you lose all your authority as a parent. It becomes versus, a battle of wills, a matter of winning and losing. That one little, innocent word—if—gives your kid the power to reject your offer or, worse, counteroffer. 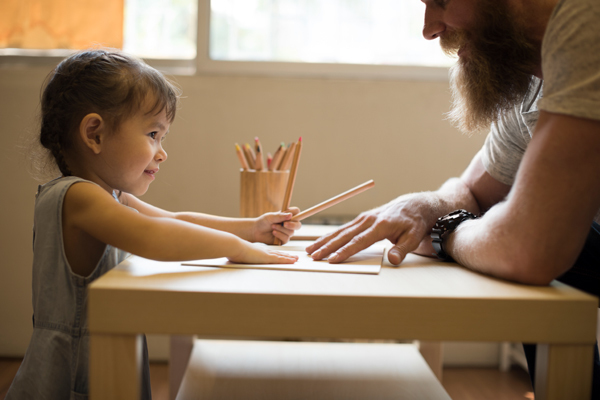 Using the word when, on the other hand, implies that it—whatever it is you’re asking—is going to happen one way or another, and the one doing it will be your child. There is a clearly defined cause and effect. Little Billy or Bobby Sue isn’t eating a cookie right now because he or she has chosen not to clean up the playroom—and not because mommy and daddy are heartless, tyrannical negotiators holding out. Bringing back the idea of the Best Husband & Father Ever Award . . .
You won’t be perfect. You are going to mess up. And you’re probably not going to win any awards (because there really aren’t any other than knowing you’ve raised healthy, well-adjusted kids, and who can put a price on that?). It’s okay if you struggle. One the most amazing things about kids is just how much they can love you despite your flaws and failures. You’re going to be mighty tempted to compare yourself to others, if for no other reason than to gauge how you’re doing. Social media is especially dangerous here. It’s a trap. Making these comparisons won’t help you be a better parent. In fact, useless comparisons will hold you back. Instead of comparing yourself to other moms and dads and complete strangers, compare yourself to yourself. 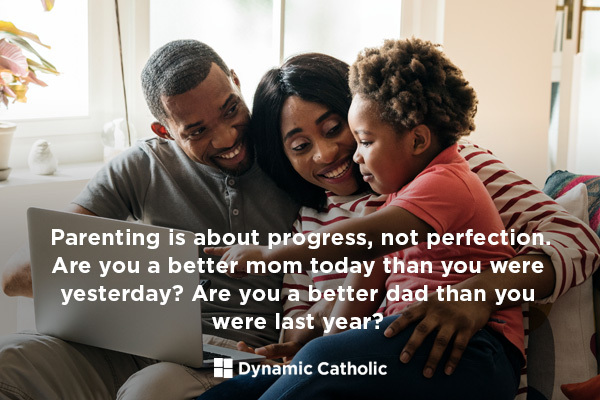 Parenting is about progress, not perfection. Are you a better mom today than you were yesterday? Are you a better dad than you were last year? Before bed every night, my wife, my little girl, and I all sit down to say our prayers. After we pray, my twenty-one-month-old daughter—with her cuteness glands secreting obscene amounts of Awwww!—presses her little palms together and joyfully says, “Amen!” And then, in a move that is equal parts adorable and heartbreaking, she immediately follows that up in the same breath with a “Buh-bye!”—complete with a wave—meant just for me . . . proactively ensuring, she thinks, that it will be mommy reading her stories and putting her down for the night instead of daddy (God forbid). No matter what happens, there’s really only one thing you can do . . . your best. If I had taken any of this personally, I’d have taken to the bottle months ago. Instead, I just smile. In fact, I love every moment. Every tantrum. Every time she’s just as stubborn as I am. Every time she cries when I pick her up instead of mommy. Every time those little fists try to knock me out with a baby haymaker. Even the time she bit me (and broke the skin!). Why? Read on to number five and you’ll see . . .
You hear it all the time. You think, Yeah yeah, times flies . . . yada yada yada. And then one, then five, then ten years slip by in the blink of an eye. These days are so, so, so finite. I already miss the chest naps! (Luckily we’ve got another bundle of joy—or tyranny—on the way.) I can hardly remember my daughter’s first year. It feels like she’s always been a toddler. And the thought of one day forgetting much of her toddler years is terrifying. I want to cling onto them, spend every moment with her, experience every moment fully present. Before long, she’s driving, then dating, then off to college, and then I’m walking her down the aisle. There will come a time when I look back with tears in my eyes and pain in my heart, longing for the days of temper tantrums and little, tiny flying fists and little, tiny heads furiously shaking no. There’s a countdown—whether you’re aware of it or not—so take nothing for granted. A child is more than twice as likely to pick up smoking if his or her parents smoke. This data comes from The Big Book of DUH! But this kind of statistic isn’t limited to smoking. I can already see our little girl imitating us—the things we say, and the things we do. Because here’s the cold hard truth: habits are hereditary. When you change your habits, you change your children’s lives, too. Let that soak in for a bit. Things you are doing now have a lasting impact on your child for years to come. If “do as I say, not as I do” is a part of your lexicon, jettison it now. Kids are like the Eye of Sauron—they see everything you do! Your kid isn’t going to magically develop great habits on his own. If you’re on your phone all the time, your kids are going to be on their phones all the time. If you snack on junk food and drink nothing but soda, your kids are going to snack on junk food and drink nothing but soda. If you are negative, selfish, and often blame others, your kids are going to be negative, selfish, and often blame others. If you respect money, save well, and give generously, your kids will likely do the same. If you eat well, exercise regularly, and practice good sleep habits, your kids will probably do the same. If you are selfless and kind and loving and honest, your kids will tend to be selfless, kind, loving, and honest. Start now. When they’re little, you think you have tons of time to help mold them into the-best-versions-of-themselves. But most studies show that you have just seven to nine years before your influence on your kids, their moral compass, and their decision-making skills begins to fade. Nine years. Pass on healthy habits. Pass on happiness. When a baby gorilla tries to flush its dad’s watch down the toilet or buys $873-worth of denture creams using the Amazon Echo, I have no idea how the dad gorilla responds . . . But I do know that being a parent is a complex, confusing, painful, joyful, sometimes-infuriating, more-times-rewarding experience. I’ve learned a lot so far, though I’m willing to bet I’ll be needing that $873-worth of denture creams before I stop learning. Shoot, parenting is learning. And there’s one nugget of wisdom I’ve learned that trumps everything else. No matter what happens, there’s really only one thing you can do . . . your best.